The trip started with a stop at In-N-Out Burger. Man, that was good food! The potatoes for the fries were peeled and cut in the location, and the burger was excellent. I could see this chain doing well in the Dallas area. We don’t have realistic fast food alternatives to the usual suspects: McDonald’s, Wendy’s, Whataburger, and Burger King. 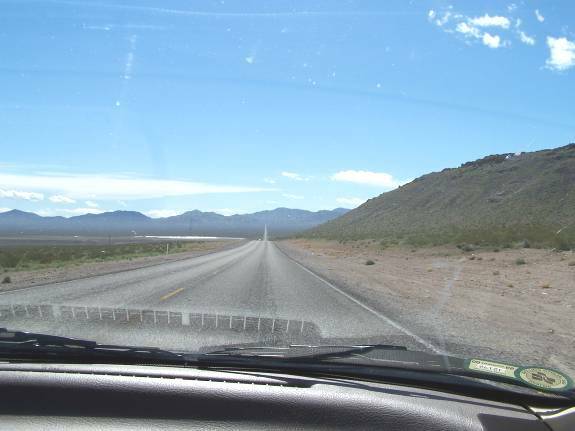 The drive to Death Valley was fascinating for a Texas green grass flatlander like me. I saw scenery, mountains, hills, and terrain! Even more fascinating was the absolute lack of green grass anywhere! 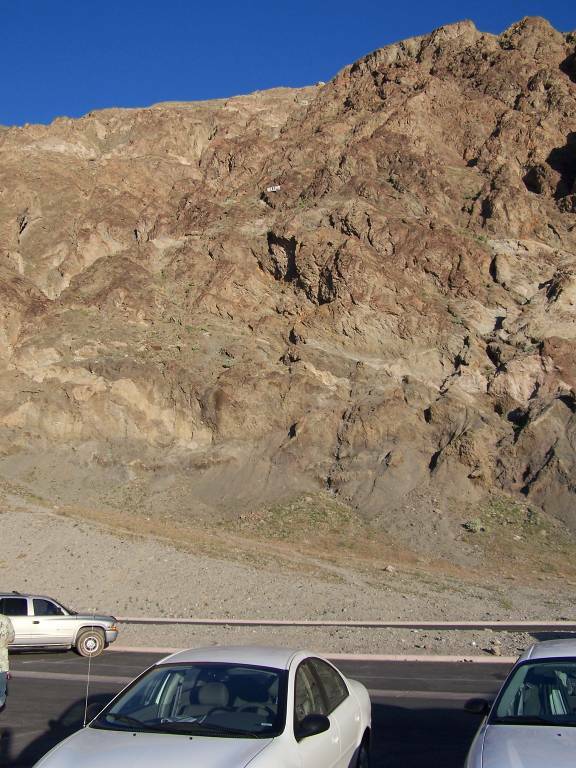 Even in Las Vegas, empty lots were mostly piles of rocks and dirt. In Texas, I am used to empty lots quickly becoming overrun with weeds. I am used to actual yards of Bermuda or St. Augustine grasses. People in Las Vegas have rock gardens for lawns! I used to live near strip mine operations in east Texas, but because of the trees they were never visible. 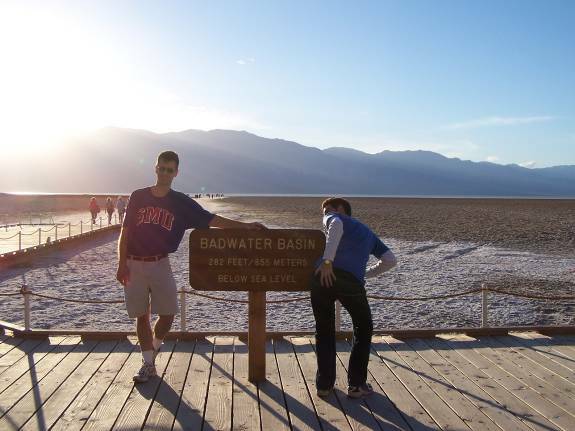 As we neared Death Valley, I noticed a basin that looked especially arid. At first I thought that this area was the Valley, but I was mistaken. It turns out that this area is in fact the Amargosa Desert. 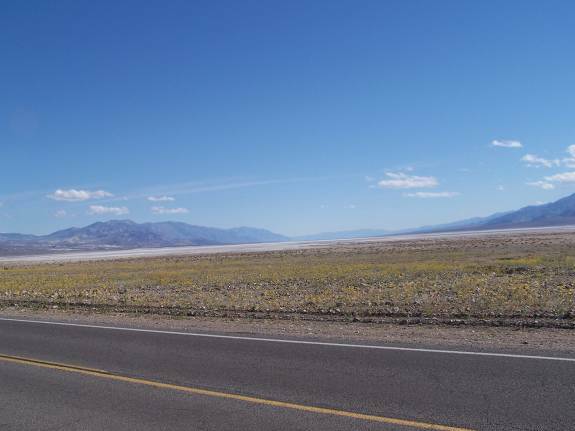 This is a picture of the desert basin on Nevada 374, the road between Beatty, NV and Death Valley National Park. 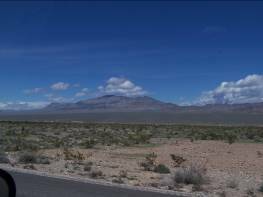 By the way, a metal building on NV 374 just west of US 95 in Beatty is the Yucca Mountain Information Center. 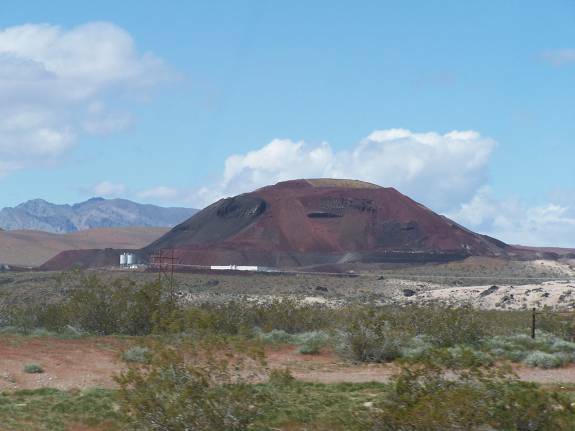 Yucca Mountain is that controversial radioactive waste dump the federal government. 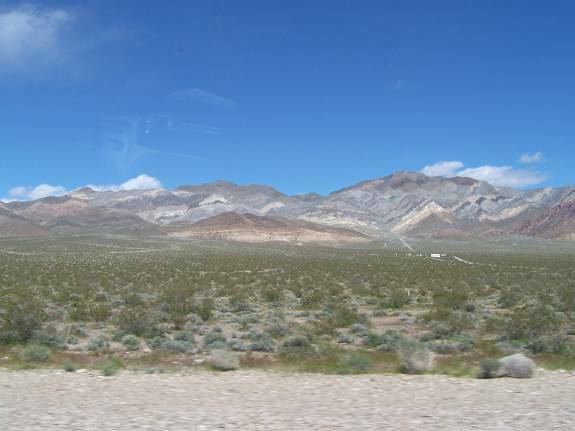 After driving through the area, I could hardly imagine a more desolate site than Yucca Mountain. 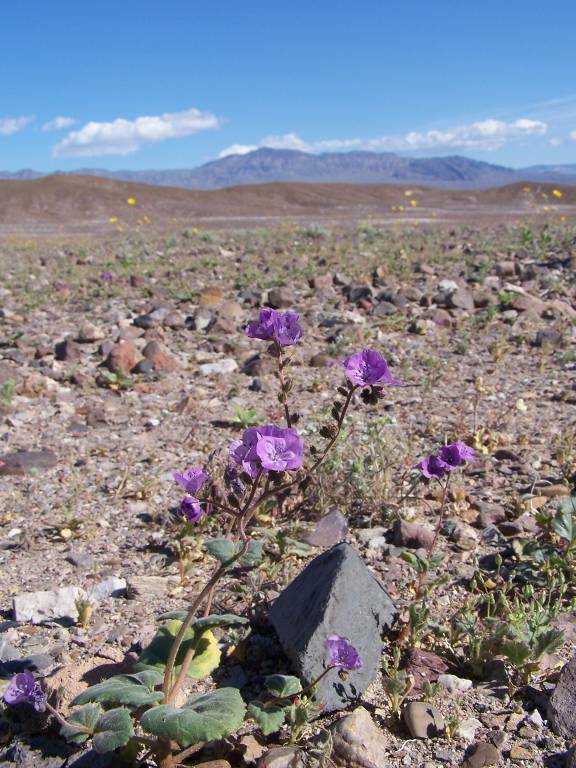 Death Valley National Park starts just before the mountain range about 25 miles away. You can see them in the background of the above picture. The basin sits on the other side of the mountains. By this point, we are ascending that mounting range. 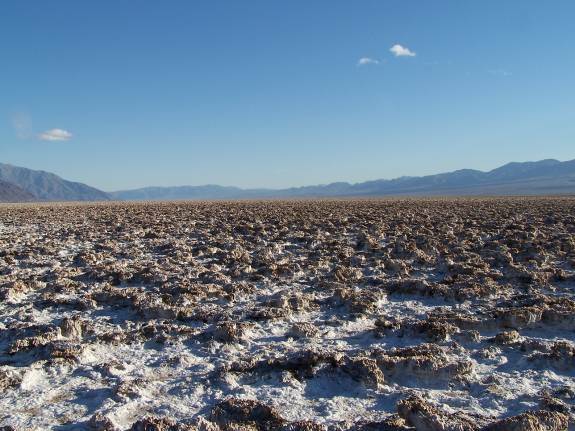 The white stuff in the background is all the salt at the bottom of the basin. This picture is looking roughly to the south. 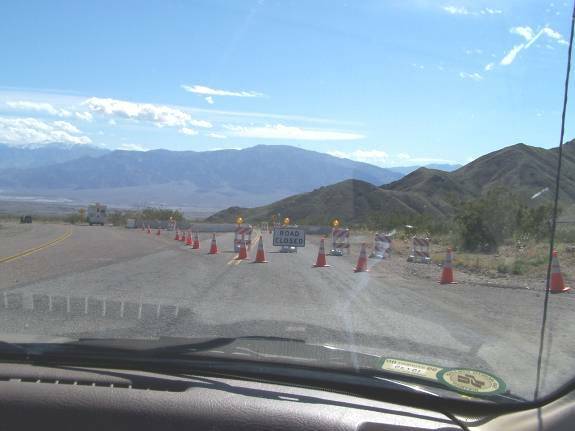 Right after the visitor kiosk, the main road is shut off, forcing you in on a side road. Flash floods in 2004 wiped out several roads in the park. The whole area was fragrant. Keep in mind that this is a barren desert. These are a few hundred feet in the distance. 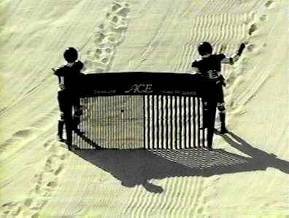 I wonder if these are also the same dunes where the Spaceballs guys “combed the desert”? 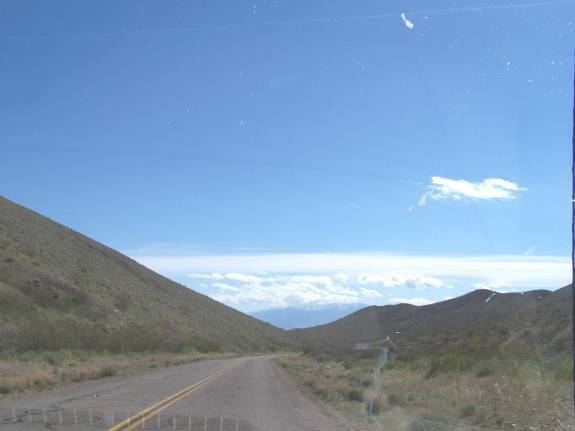 It’s hard to make out, but we are at sea level as we head back south on CA 190 to the Death Valley Visitor Center. We’re still on the way to the visitor’s center. This is a view looking west from CA 190 across the basin. Notice the flowers. I think the mountains in the distance start at about 15 miles away. 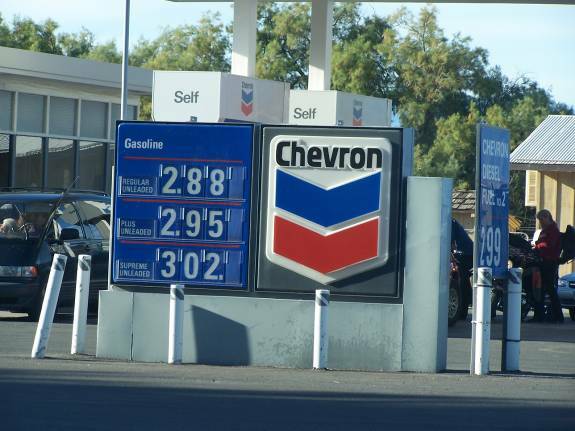 Gas is expensive at the visitor center! 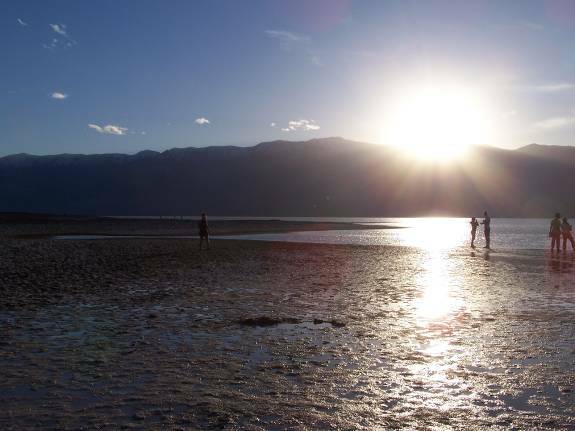 After the visitor’s center, we stopped by the Devil’s Golf Course. 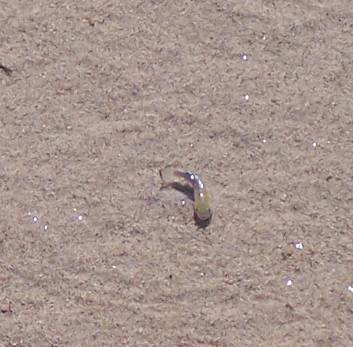 This is salt left over from evaporating water. 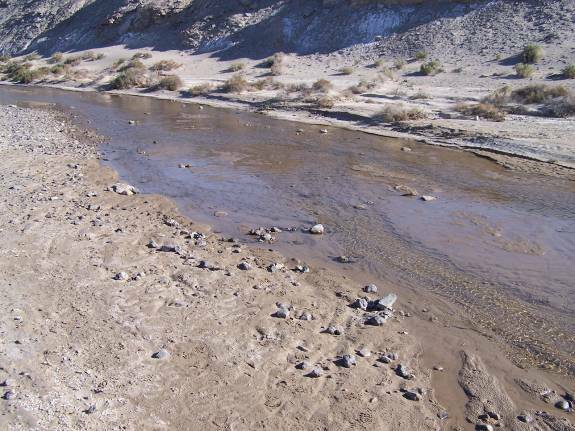 Water in Death Valley basin has nowhere to go but evaporate. All minerals are left behind. Our travel guide warned us that this stuff is so hard that you can easily break bones if you trip. That’s my brother on the right being an idiot. He’s good at that. 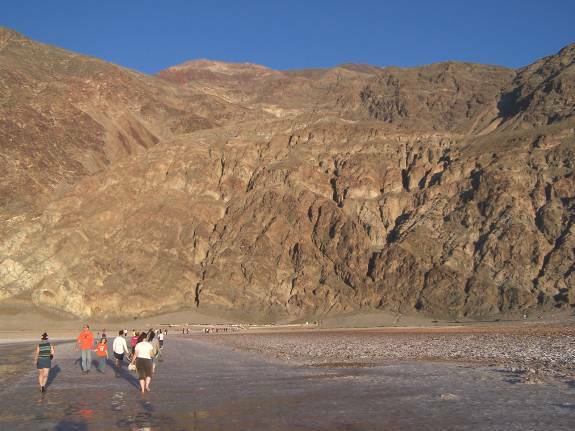 Would you believe that the basin of Death Valley had standing water? Yup, that’s water. Not deep, and very salty, but water none the less! 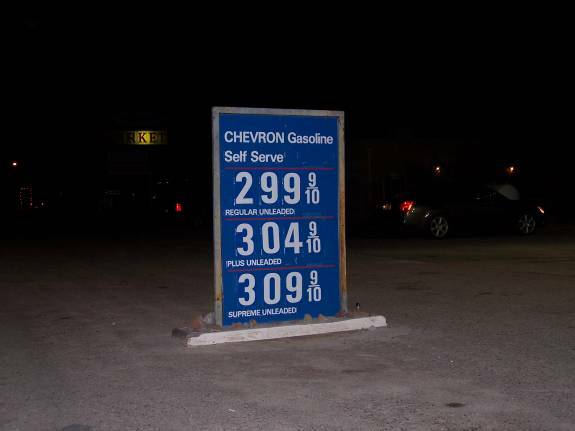 Mind you, this was late March. I doubt there will be any water here in August. Remember that rock wall with the sea level sign? Step away about 1000 feet and you’ll see that it’s only the foothill of a far larger formation. 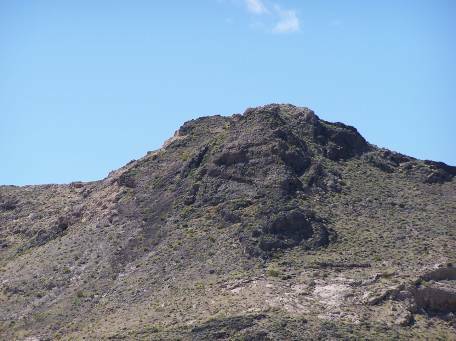 You can barely make out the sea level sign about 1/4 of the way up this formation. 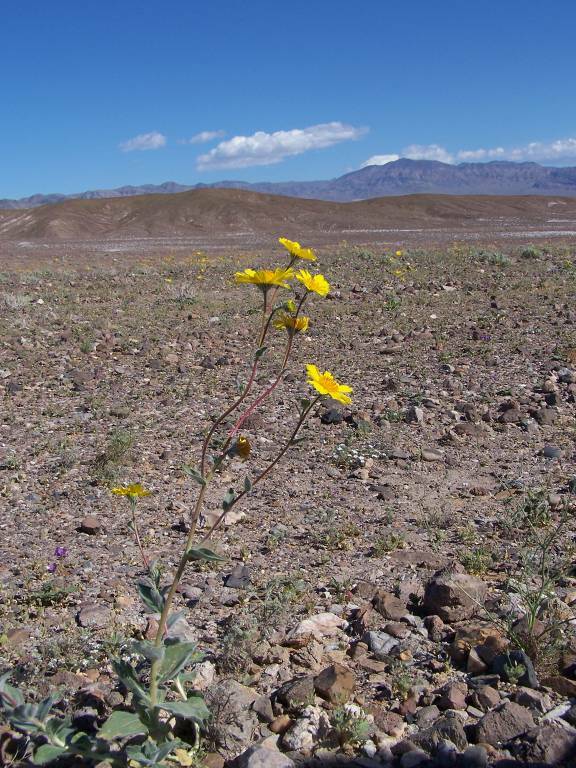 Death Valley was absolutely fascinating and stunning. I never imagined that it would be as beautiful. 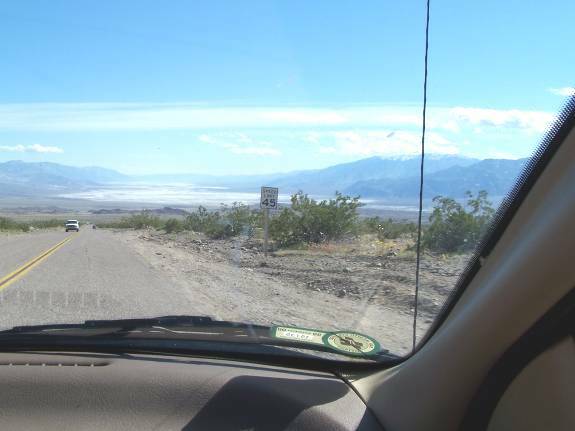 One thing I realized is that I always imagined that Death Valley was the area on I-10 between Arizona and Los Angeles. That area is actually the Mojave Desert. 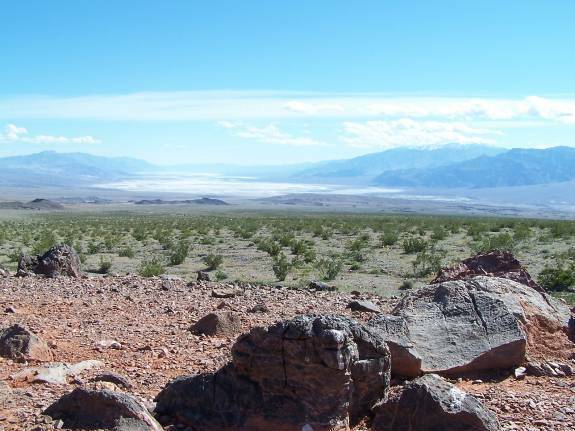 The visitor center says that despite its name, Death Valley is not a particularly deadly place. Hey, I’m glad you liked things here out west. 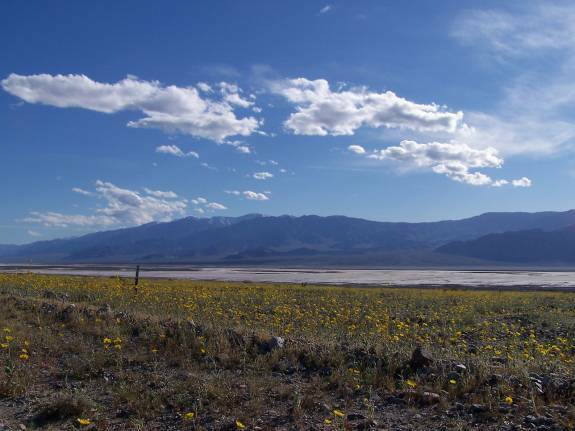 I’ve always loved the desert, and Death Valley in particular. 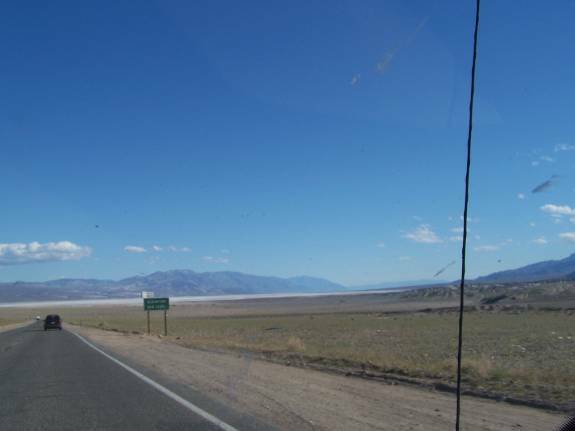 Once correction — I-10 passes through the Colorado Desert; it’s I-40 and I-15 that pass through the Mojave. 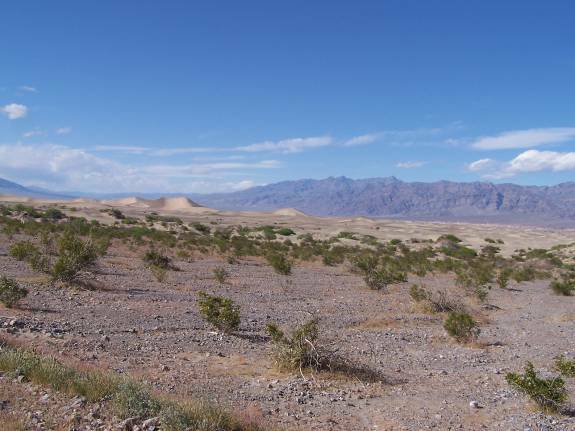 The difference is the elevation (Colorado is low, Mojave is high) and vegetation (the Mojave has Joshua Trees).